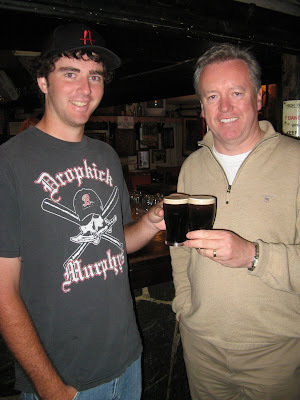 If Danny’s follows the path of far too many Irish men, we’ll know where it all began. Here he is with our host, John Saunders. We visited Johnnie Fox’s after our first day tour of the countryside outside of Dublin. It’s a dusky old pub, established in 1798, full of old framed newspaper pages commemorating great events in Irish history. Sitting at the top of a hill outside of Dublin and fed by a narrow, curvy road, you wonder how its patrons, after many pints, were able to navigate their way home without incident. No doubt many didn’t. « We interrupt this program…..